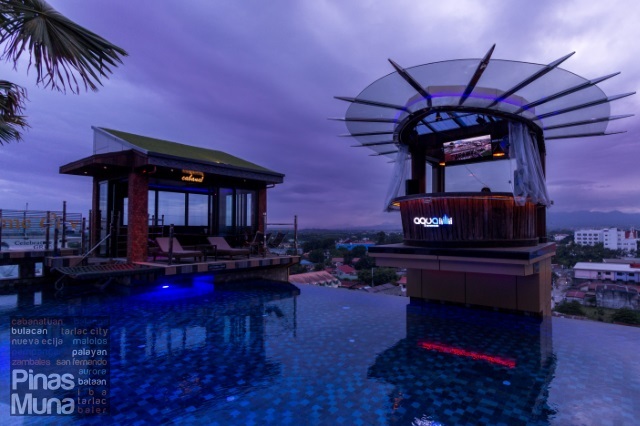 Aqua Beach Club is an integrated party, entertainment and wellness club located on top of ABC Hotel in Angeles City, Pampanga. 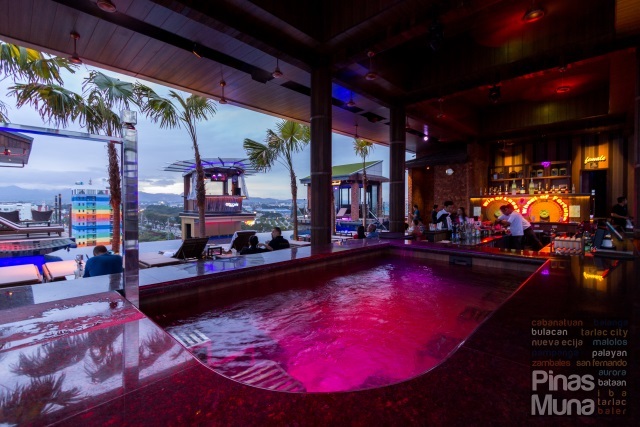 It opened only in December 2016, making it the newest party place in the greater Angeles-Clark area. Aqua Beach Club is also the only daytime and nighttime party club in the Philippines which opens as early as 11:00am and closes at 2:00am. 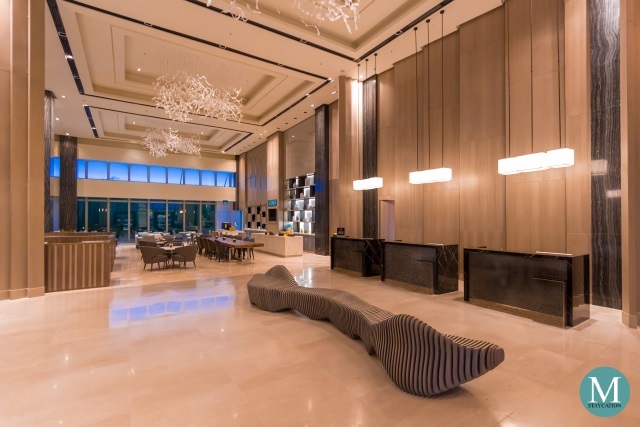 With the increasing number of flights connecting Clark International Airport to major cities in the Philippines and abroad, Aqua Beach Club does not only cater to the locals, but to tourists and transit passengers as well. 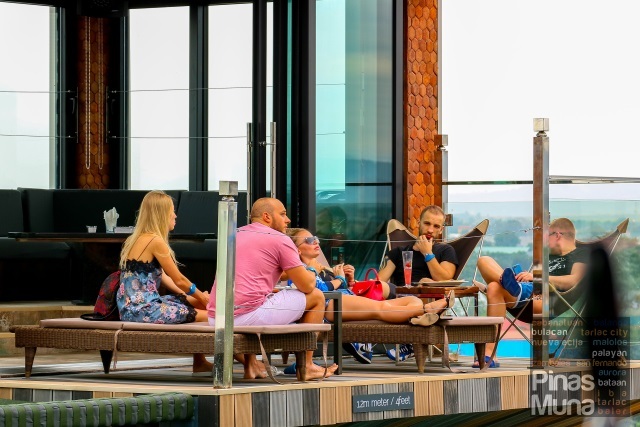 We visited Aqua Beach Club a few weeks ago where we've meet a couple of guests coming from various countries like the United States, Russia, Korea, China, Germany and United Arab Emirates. There were a few locals, but most of the guests at Aqua Beach Club were foreigners. In fact, a lot of the guests we met were repeat customers. This only shows that Aqua Beach Club appeals to and meets the standards of international travelers. Let's find out what makes them keep coming back to Aqua Beach Club. General admission fee to Aqua Beach Club is very affordable at only P500.00 (~US$10.00) for men. What's even better is that the full amount is consumable. Women on the other hand should rejoice because Aqua Beach Club does not charge general admission fee to female guests. 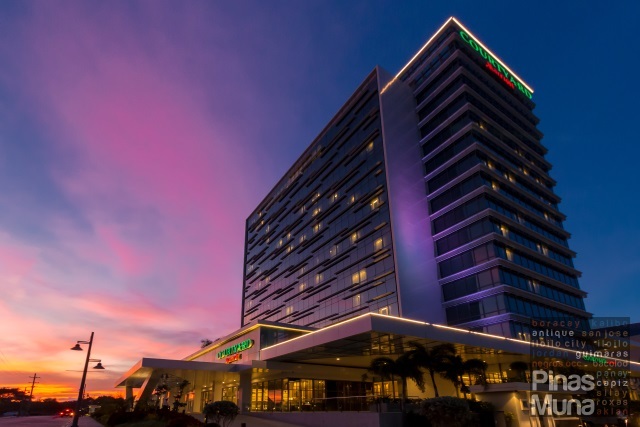 For an additional fee of P250.00 (~US$5.00), paying guests get their own locker, access to the changing room with provisions of a towel and a robe. 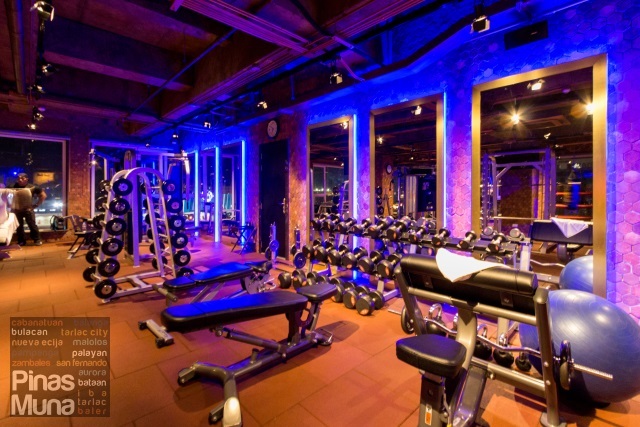 The fee also covers the use of the gym, the spa and the pool. 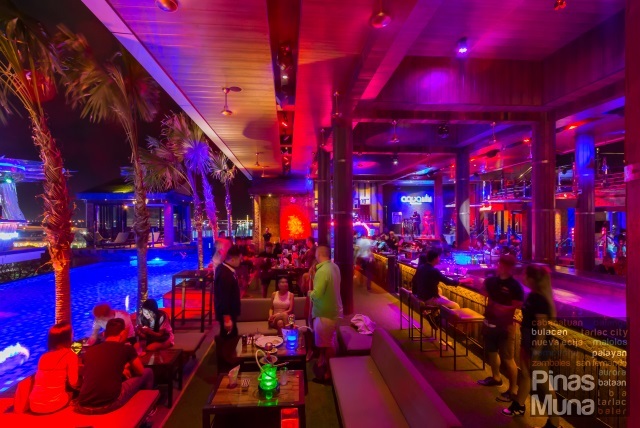 General admission gives the guests access to the cocktail bar, the heated jacuzzi with submerged bar seating, VIP Tables and Private Cabanas are also available for a fee. The Sunbed VIP Tables, the Silver VIP Tables, and the Gold VIP Tables can accommodate six, eight and ten persons, respectively and can be reserved for half-day or full-day use (Check Rates). Aqua Beach Club also has four Deluxe Cabanas (Cabana 3-6) with each cabana can accommodate eight persons. 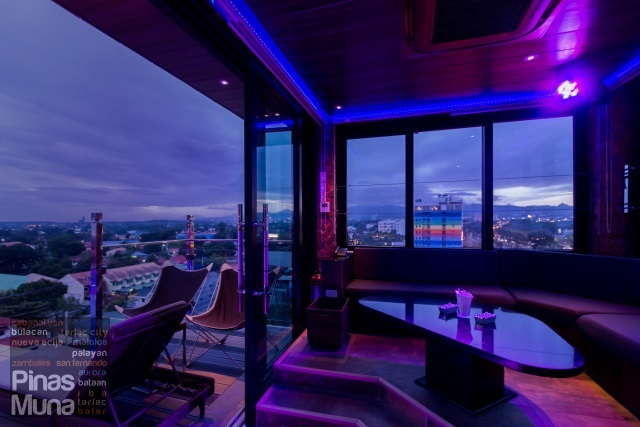 This 2-story cabana has a living area equipped with eight private safety deposit boxes (one for each guest), an LCD television, phone, individually controlled air-conditioner, Bose surround sound system, and party lights (Check Rates). Deluxe Cabana guests also enjoy direct access to the pool and easy access to the cocktail bar and the heated jacuzzi. 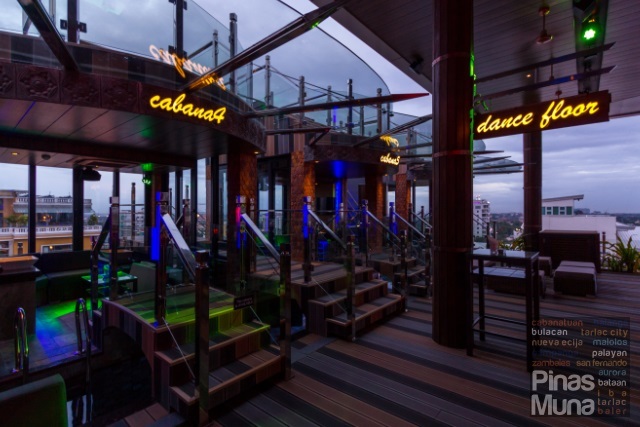 The second floor of the cabana serves as a private sun deck where guests can lounge on the sun beds while enjoying the sunset or the nightscape of Angeles and Clark (Check Rates). 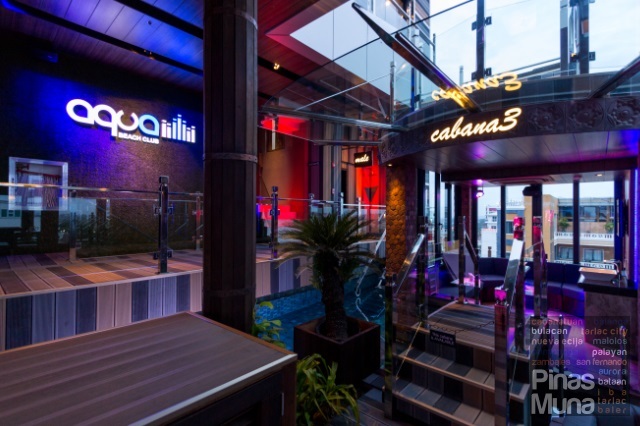 For the ultimate luxury party experience, you should book the Presidential Cabana (Cabana 1 & Cabana 2) which has direct access to the main pool and a sun bed hammock and a sun terrace with loungers (Check Rates). Each Presidential Cabana can accommodate up to 12 persons. 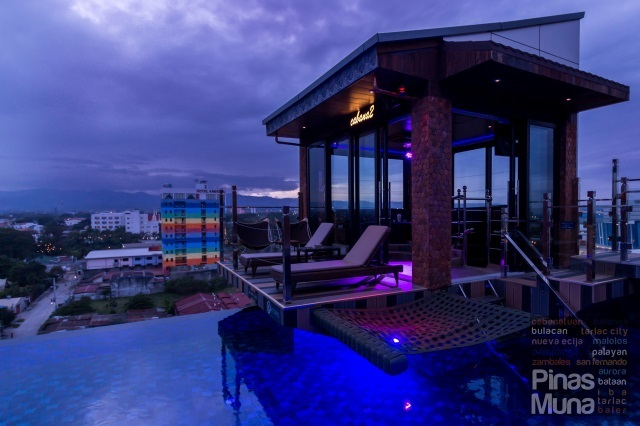 The cabana is funished with glass doors, comfortable lounge sofas, and equipped with individually-controlled air-conditioning unit, LCD television and Bose surround sound system (Check Rates). The cabana also has a basement level which houses a private bathroom with separate walk-in shower and water closet. 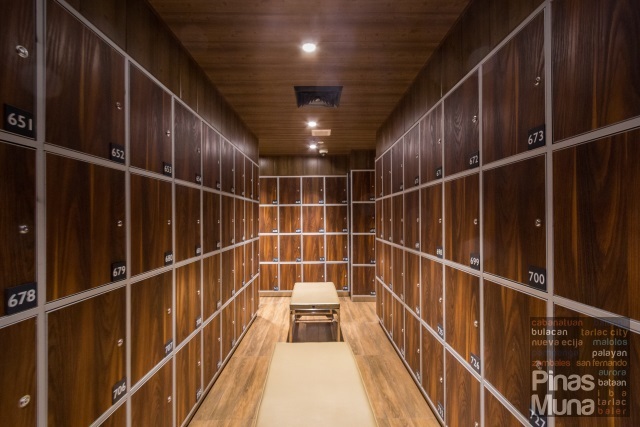 Next to the bathroom are 12 private lockers, one for each guest. The cabana has its own telephone which guests can use to order food and drinks from the cocktail bar (Check Rates). Non-stop live DJ performances run from daytime to nighttime. Aqua Beach Club guarantees a unique experience for every visit as every day has its own music theme. Mondays are Summertime Fiesta day while Tuesdays are Mardi Gras themed. Wednesdays are Ladies's Day dedicated for tunes that will set the mood for ladies to dance. Go loco with Latin Day Thursdays. Fridays and Saturdays are Wet & Wild Weekend starting with the Sunset Sax Sessions in the afternoon until sundown, while evening party starts at 7:00pm. Home-grown DJs spin the night with upbeat dance, house, club and mashup music. 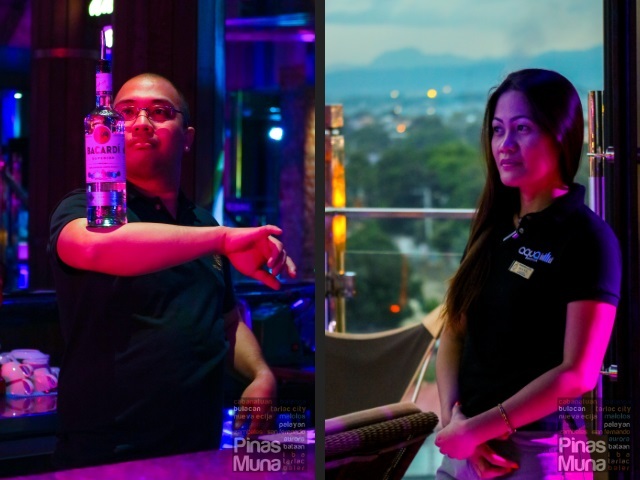 On special occasions and holidays, Aqua Beach Club would also invite famous DJs from Manila, Baguio and other cities in the Philippines. 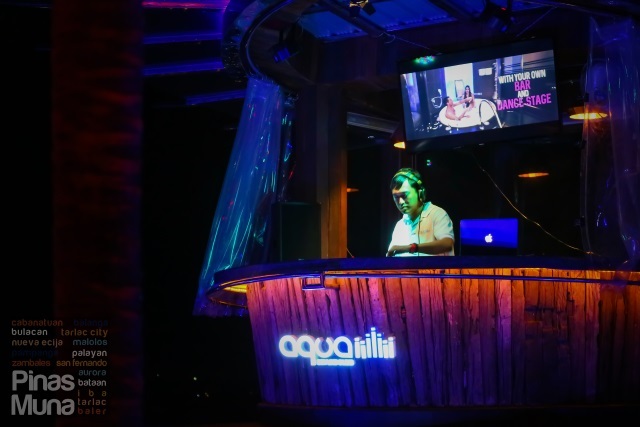 Some of the DJs that have guested at Aqua Beach Club include DJs Marc Marasigan, Janice Dizon, Kimmy Lopez, Yuki Gutierrez, and Carla Espiritu. 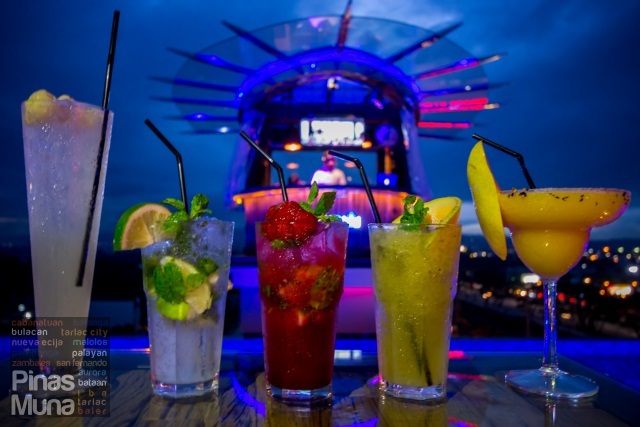 And of course, your Aqua Beach Club experience won't be complete without sampling their drinks expertly prepared by their in house mixologists. We tried the Hugo's Gyn, Classic Mojito, Pink Brazil, Melon Frozen Mojito, and the Frozen Chili Mango Margarita. We met Ricky, one of their mixologists, and he is the one responsible for the addicting fiery taste of the Frozen Chili Mango Margarita. I was so impressed that I challenged him to create a melon version of the cocktail. And there it was, my customized Frozen Chili Melon Margarita! You're the man, Ricky! 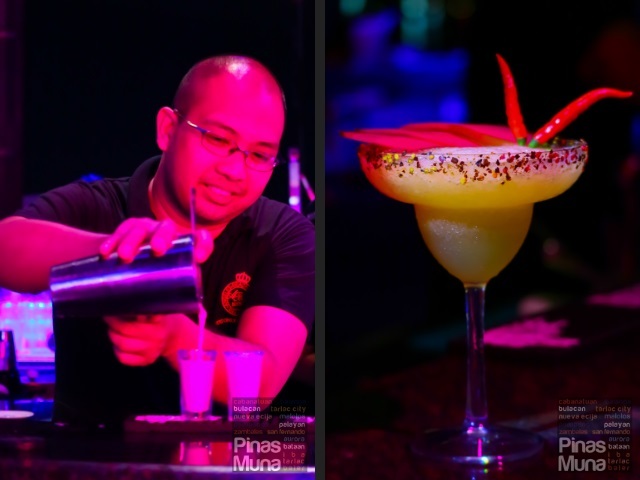 Just like anywhere in the Philippines, it is the F&B team that will make your experience extra special. Filipinos are natural hosts, and many of them are gifted with the talent to perform and entertain. 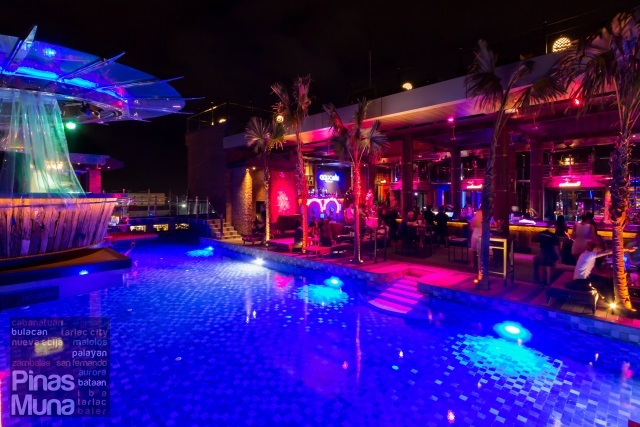 Aqua Beach Club hired some of the best and more experienced in the industry. You already met Ricky. And then there is Ms. Maye, the premier host and creative manager of Aqua Beach Club. When you visit, make sure you look for her, she is the best host ever. She will make sure that you are having a great time. There's never a dull moment at Aqua Beach Club. People are very spontaneous. 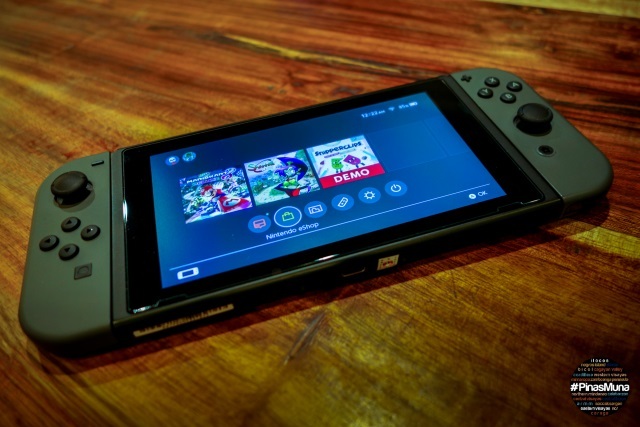 Games and live entertainment are happening left and right. There's bottle juggling competition, there's syringe shot challenge. People are just having fun but not going out of control. This is the type of crowd you can expect at Aqua Beach Club. 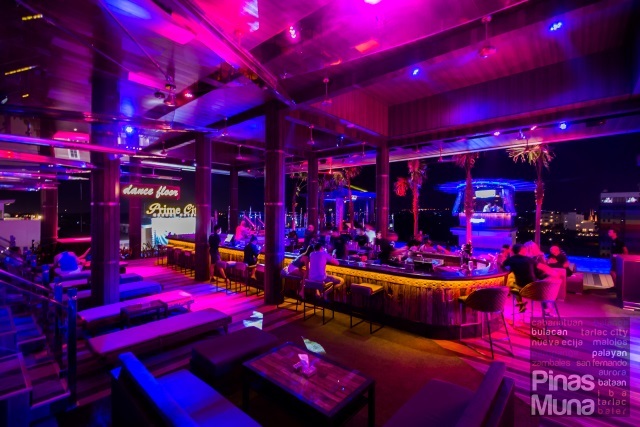 Lastly, it is the whole ambiance of Aqua Beach Club that elevates the experience. 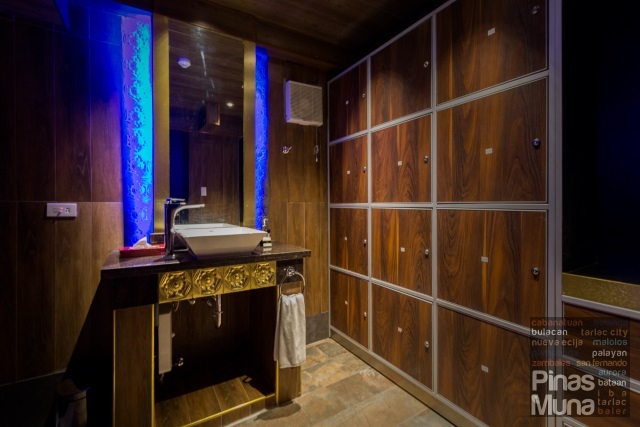 Everything is well designed, furniture pieces were well selected to suit the luxurious feel of the club. Every corner looks well maintained. The restrooms are constantly cleaned. 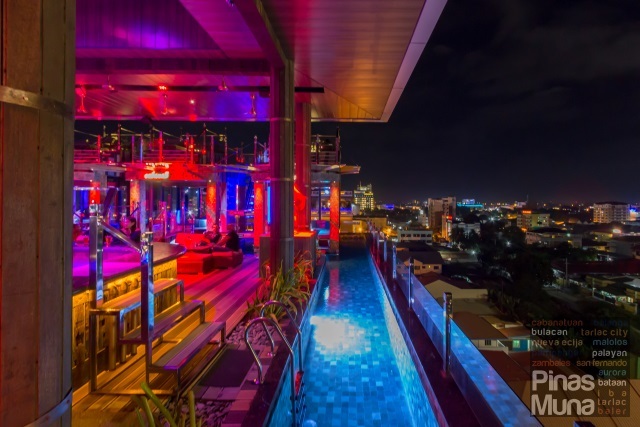 The view of the city from the club is spectacular, the city lights add to the charm of the place. 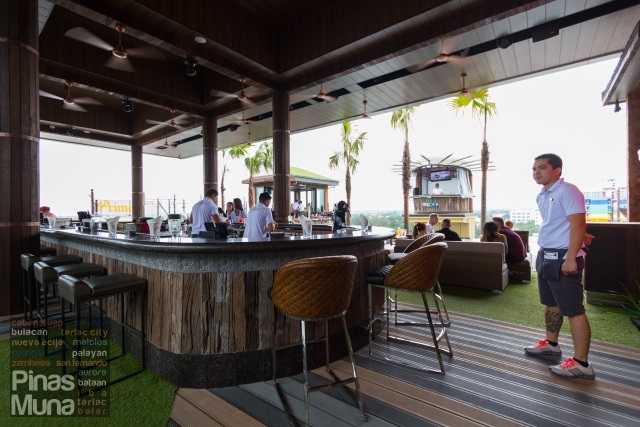 Being a rooftop bar, there is always gentle breeze blowing from different directions, giving the place a constant breath of fresh air. The high ceiling adds to the airy and spacious feel of the place. 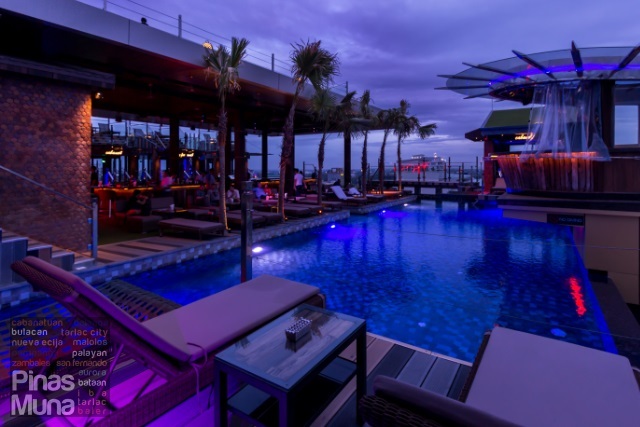 I have been to some of the best rooftop bars in Manila and nothing really compares to Aqua Beach Club. 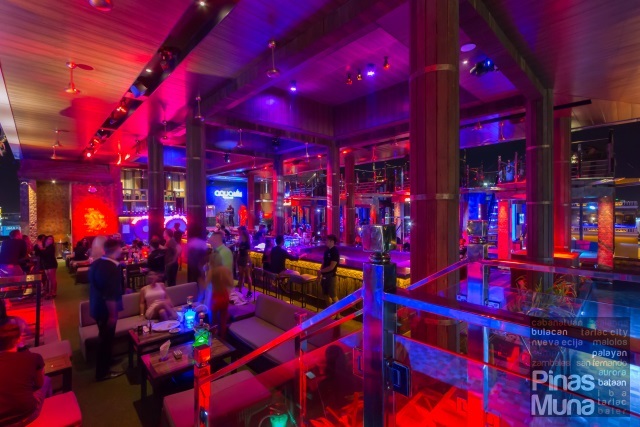 The concept isn't really complicated, but is the way the concept was executed with so much creativity and innovation that makes Aqua Beach Club stand out. 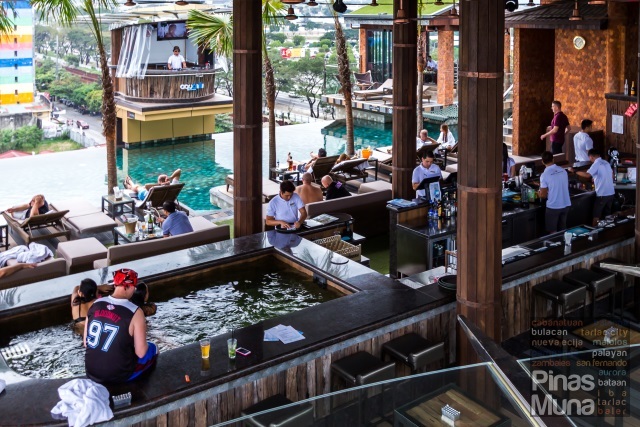 If you are flying into Clark soon, make sure you drop by Aqua Beach Club for some drinks. If you happen to be visiting during the summer months of March to May, then the outdoor pool will surely cool you down. 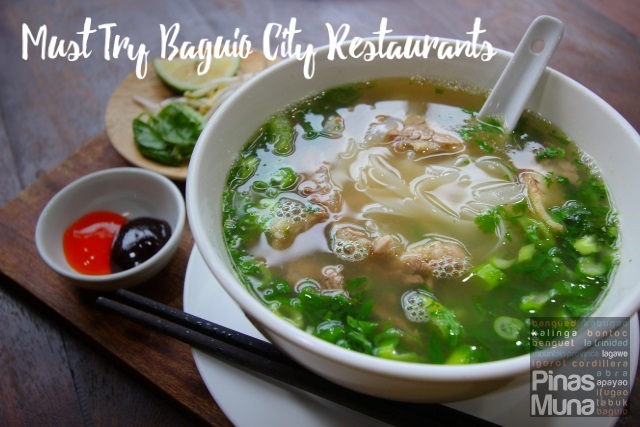 And if you are coming from Manila, I tell you, it is worth the two-hour drive to Clark. 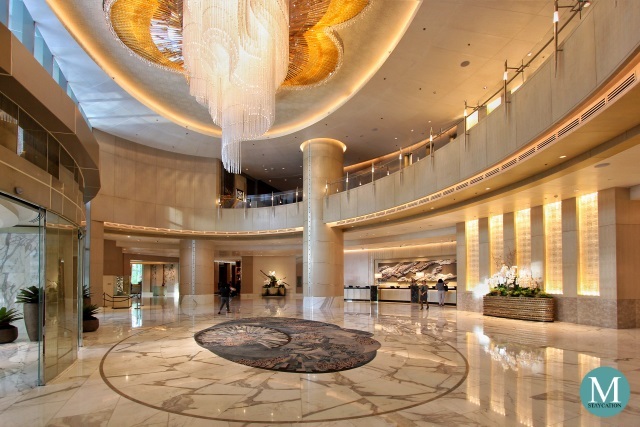 IMPORTANT: The Aqua Beach Club Reception is located on the 7th Floor of ABC Hotel. Upon registration, you will be given a wristband with your personal account number. 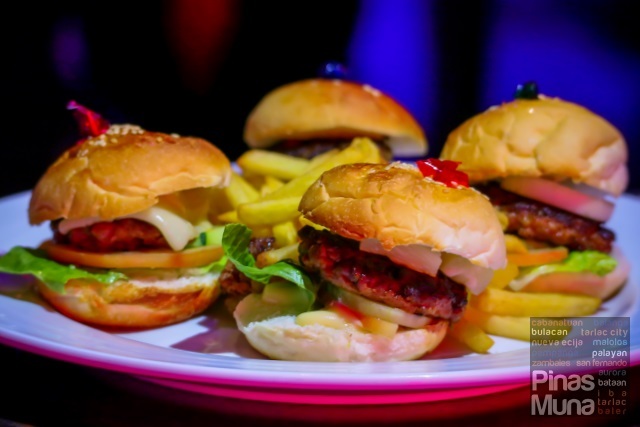 All drinks, food and services availed during your visit will be charged to your account (upon verification of your wrist band) and all payments shall be settled upon check-out. Make sure you don't loose your wristband.